2013 marked my 20th straight Oregon Star Party. For the past few years, I've really pulled back from the astronomy hobby, but this year I've been able to get out with the scope a bit more. The advanced-level observing list seemed intriguing this year, and do-able with a 10" Dob since I had already seen 8 of the objects with my scope. So I planned to focus on that as my observing project under the clear and dark skies of Indian Trail Spring. Unfortunately, this wasn't meant to be one of those years with good weather at OSP. There was smoke over much of Oregon due to wildfires, but the bigger threat to viewing was the regime of clouds, showers and thunderstorms that developed earlier in the week and lasted throughout my three nights at the star party. My observing report follows. As usual, I've also posted a photo gallery. It was cloudy on the drive up (except around Bend where it was partly cloudy but smoky). As I pulled into the OSP site, a large dust devil enveloped my car. Yep, great weather. I parked along the entrance road this year in case I needed to make a quick exit. I attended a couple of presentations. The first was a discussion led by Chuck Dethloff on setting the dates for OSP in 2014. Traditionally, it would be held just before Labor Day, but some have expressed interest in the last weekend of July. The advantage of the July dates is (purportedly) a smaller chance of widespread wildfire smoke, as well as being friendly to the schedules of educators and parents who find Labor Day weekend inconvenient. The disadvantage of July is that astronomical twilight doesn't end until later at night and comes earlier in the morning. Personally, for astronomy purposes I would prefer the late August dates because of the longer nights and because I have Labor Day off from work. On the other hand, from a daytime naturalist's perspective it would be interesting to have an excuse to travel to the Ochocos during a season when I don't normally visit. The real wild card for astronomy is the weather, and that is something nobody can predict a year in advance! Ben Canales, whose time-lapses of the night sky have been Internet sensations, gave an exciting talk with lots of incredible shots. The locations, and often his improvised lighting, are what make his work so special. Andy Cooper from the Keck telescopes in Hawaii gave an entertaining keynote speech, with a lot of details on the logistics of keeping two 10-meter telescopes "on sky" and in particular the adaptive optics system that compensates for atmospheric seeing. After a nice sunset, it was still overcast and threatening to rain. I kept my Dob in the car, but set an alarm for 2:45am. I woke up at 2:08 to clear sky and scrambled to get ready. It took me 20 minutes before I was on sky... My first target was Comet C/2010 S1 (LINEAR) in Cygnus. I hadn't seen this little 12th-magnitude comet yet, and it quickly became clear that my mind was still half-asleep. 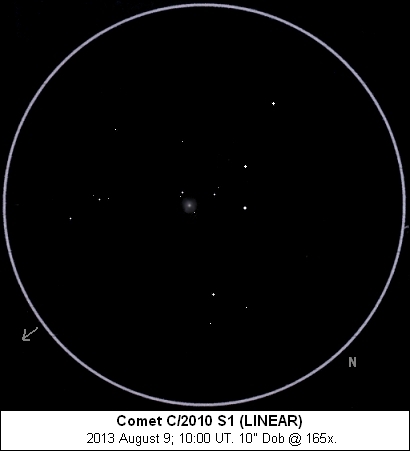 I think it took me another 15-20 minutes to figure out my finder chart, but once I did I found the comet. It was dim and small, but also very condensed with a round coma and a stellar nucleus. On Friday morning, the clouds gradually cleared out for a nice day. I always take a hike or two to Indian Trail Spring, but this year was the first time I joined the organized hike. The highlight was that someone reported seeing a cougar, which made everyone a bit jumpy. Some of the best observing of OSP 2013 was of our daytime star. Bob Yoesle, who gave a presentation on different methods of solar observing, had an incredible set-up with two refractors. One used a Herschel wedge for detailed white-light views, while the other was a double-stacked 90mm H-alpha rig that provided the most contrasty and detailed views of the sun that I've seen. The clouds rolled in during the afternoon, and during the telescope walkabout there was a spectacular lightning storm to our north. Of course, by the time I got back to my car to set my camera on a tripod it was basically over. Another cell rolled over and dumped brief rainfall on the site, as well as a very close lightning bolt. There were some promising breaks in the clouds after sunset, with Venus and the crescent Moon peeking through. Saturn looked OK considering its low altitude, with the Cassini Division visible part of the time. Then, a thunderstorm rolled through, with most of the energy to the north of us. I took a few photos of stars above the retreating storm, while I watched the sky with my observing field neighbors Bob M. and Jim from Bend. When there got to be a lot of stars visible, I decided to go back to my scope. Then, the International Space Station appeared in the north over the lightning, and I got a couple of off-the-cuff shots with my camera. Then, it clouded up again. I took a hike to see what other people were up to, and had to hurry back to cover my scope because it started raining. It finally cleared up for good around midnight. Skies were just OK for OSP, with a limiting magnitude of 6.9 overhead and a band of diminished transparency from the horizon up to 30 or 40 degrees. Seeing was pretty decent. There was quite a bit of moisture/dew, especially later on. I tried for a couple of harder objects on the advanced observing list and missed them, so I sacked that project. I did some tiddling around (looking at M13 at 330x, going over the the Bubble Nebula and ending up at the nearby nebula NGC 7538 by mistake). 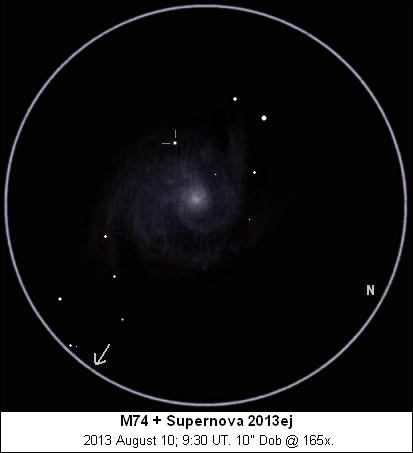 I finally hit my stride when I went over to M74 and its bright supernova. While the sky contrast wasn't as good as I would have liked, I could still pick out a nice spiral pattern in the faint galaxy. The supernova, at around magnitude 12.8, was easy to see. I had banged on Bob's window earlier to let him know it was clear, and he finally woke up and got views of the supernova and Comet Lemmon. There was a lot of hope around the observing field for earlier clearing on Saturday night. Initially, we got another dose of showers and lightning. It did gradually clear off in twilight. Transparency was pretty good, although the seeing wasn't up to Friday night's standards. The wind was a problem early on, but settled down to a minor annoyance. 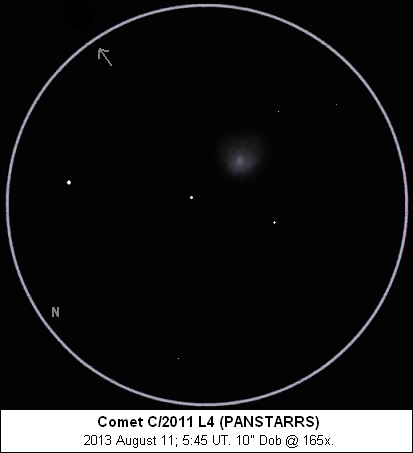 My first sketch of the night was of Comet C/2011 L4 (PANSTARRS). The formerly naked-eye comet had faded to about magnitude 11.5, still a fairly easy target. It showed a weakly condensed oval coma elongated N-S, with a faint outer halo that seemed to extend and fan out toward the SW.
By 3:00am, as I was finishing up the sketch, clouds started to come in. Bob McGown joined me for some observing, but it seemed that every time I pointed the scope at something the clouds would swallow it up. One notable sighting was a Perseid fireball of about magnitude -5 that left a glowing trail for many seconds. I stuck it out under deteriorating conditions, pointing my scope at sucker holes, until I gave up at around 4:15am. 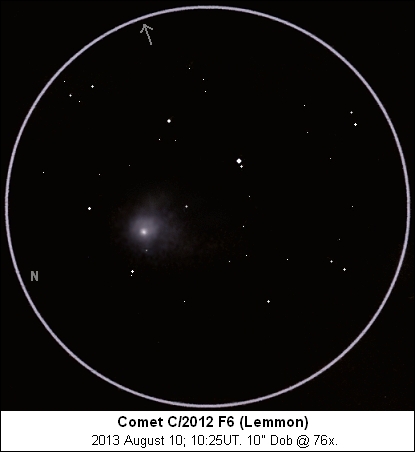 C/2012 F6 (Lemmon) was the brightest comet in the sky at this year's OSP, at about magnitude 10. It continued to show a good-sized, well-condensed coma about 3.5' in diameter with a bright core. I suspected a very faint, broad tail about 10' long pointing southward, and the western edge of the coma seemed diffuse and elongated. After that, Bob and I looked at some showpiece objects such as the Helix Nebula and the Veil Nebula. Eventually, Jupiter rose high enough to be a marginal target, and we called it a morning after getting a slightly sludgy view of the giant planet. PANSTARRS and its field stars started fading in and out, and I realized a raft of clouds had come over. These passing clouds would trouble me for the rest of the night, as I had to search out objects that were in the clear and would be for at least a little while. I never did get a good estimate of the naked-eye limiting magnitude, but it was probably around 7.0. I did play around with the 42mm eyepiece a bit. Optically, it's actually pretty good. The apparent field isn't listed on the eyepiece, but on the web I found claims of 60-68 degrees. I measured the true field at just over 2 degrees, or about 55 degrees apparent field. But what's there is sharp, with better edge correction than my 26mm Plossl or especially the 32mm GSO "SP" eyepiece that I picked up a few years ago. There is a bit of astigmatism at the extreme edge, but since it rotates when I turn my head it must be in my eye. Objects in the center are a bit more detailed in the 32mm due to the slightly higher magnification, but the 42mm was more comfortable and pleasing to look through in dark skies. It is an especially nice eyepiece for the larger/looser open star clusters, which tend to lose their identity at higher powers. I held my 1.25" OIII filter up to the eyepiece and got good views of the Veil Nebula. My main question now is how it performs under less than pristine skies. Will this be a good eyepiece to show people the Pleiades or Beehive at public star parties, or will they see the shadow of the secondary mirror? Back to deeper observing, I sketched the planetary nebula Abell 72. This was one of the objects on the level 3 observing list, and one I've seen a couple of times before without sketching. I had a decent view of this very difficult object. At first, I only suspected a faint glow around a group of stars, but as I continued to use averted vision a sharply defined oval shape briefly materialized out of the glow. The nebula appeared brighter on its western and northern edges, and with a dark center. An OIII filter was necessary to see any shape or detail at all. As the clouds chased me around the sky, I ended up at the barred spiral galaxy NGC 7479. I've never been able to see the spiral arms in my 10", but on this occasion I was able to see faint extensions from each end of the bar as well as some curvature to the southern arm. The galaxy appears as a bright, mottled bar, irregularly brighter towards the center with condensations to either side of the midpoint. A faint star is just beyond the north end of the bar, and another one is just west of the south end. A faint, mottled extension curls off the south end of the bar and forms a semicircle around this second star. An even fainter, shorter extension projects eastward from the north end of the bar and ends in a small condensation. 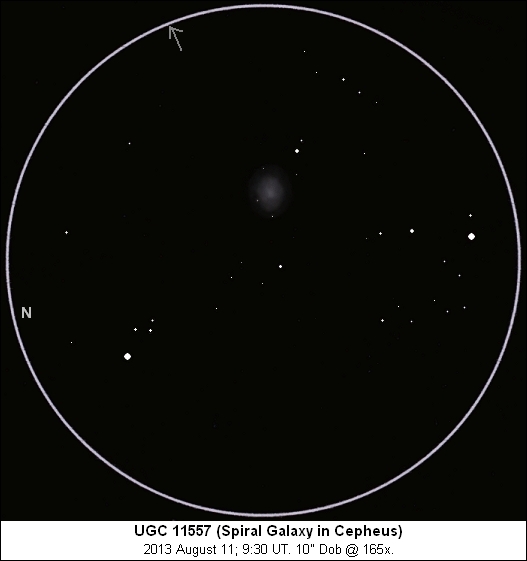 UGC 11557 in Cepheus is another object from the advanced observing list that I have seen before. This faint, diffuse spiral galaxy appears as a softly-glowing oval surrounded by several threshold stars. There is a small, brighter central core and a halo that gradually fades into the sky background. The galaxy is about 2' x 1.5' in size and is elongated ENE-WSW. I wanted to count Perseids for at least an hour, but clouds ruined my watch just after I started. I saw 9 Perseids and a couple of other meteors in 16 minutes under worsening conditions. When I went back to the scope to try to view some targets in the remaining clear spots, all of the stars had little halos around them from moist air aloft. So, I hit the sack (this time on open ground instead of crammed into my car) and probably dreamed of nebulae until the sun woke me up.